Dear furiends last night when the humans were out giving April a last chance to relieve herself before bed, they got involved with a rescue. They saw a cat struggling in the water! The cat was successfully pulled out and we cared for him overnight. I’m so happy that the story has a happy ending because today Gery was reunited with his humans, it turns out he’s French like I am! Well my name’s Gery and I’m three and a half years old. 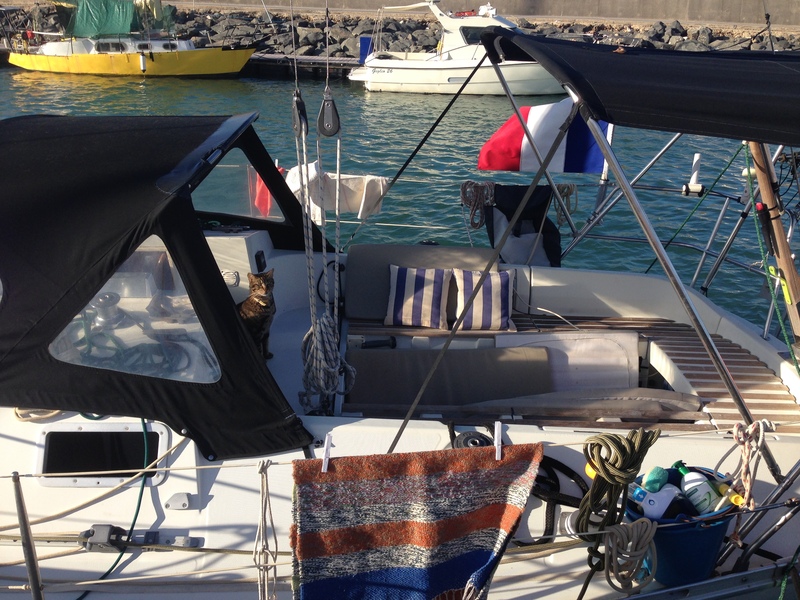 I live on a boat half the year and in a house in France the other half of the year. How did you come to be swimming last night? Well there were storms and high winds and I guess I just got spooked and misjudged a jump. To be honest I’m not really sure what happened before I hit the water. You had the humans worried when they couldn’t see you, what did you do? I tried to swim to safety but I went under the pontoon. 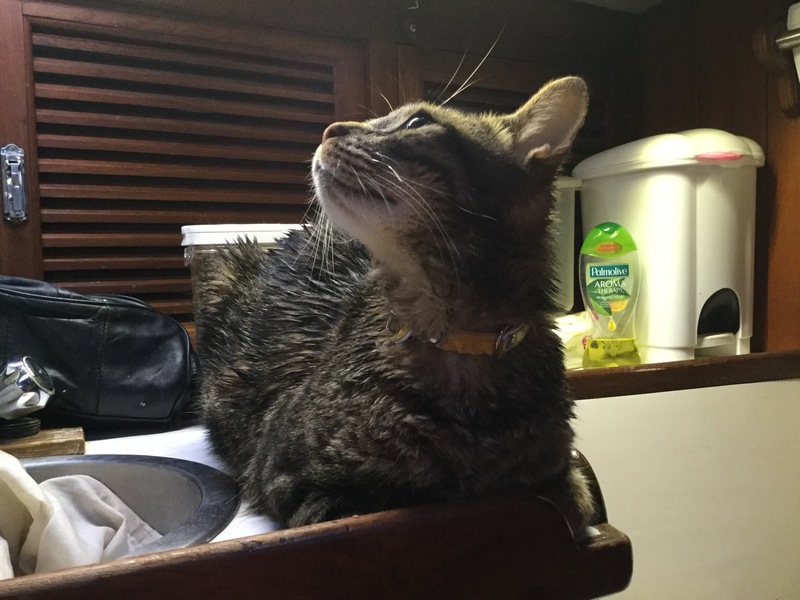 I was really afraid and I ended up hanging off the back of a boat when I was rescued. Did you enjoy your stay aboard Nocturne? Yes thank you. It was very kind of you, April and the humans to let me stay the night. 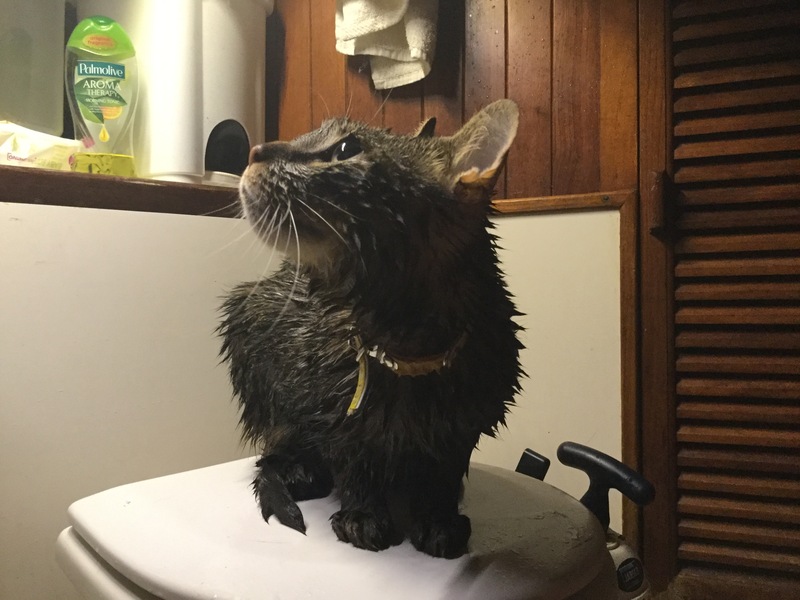 Your humans gave me a little shower with the fresh water hose on the pontoon and then waited to see if I would run home, but I was so scared that I stayed glued to your mum. 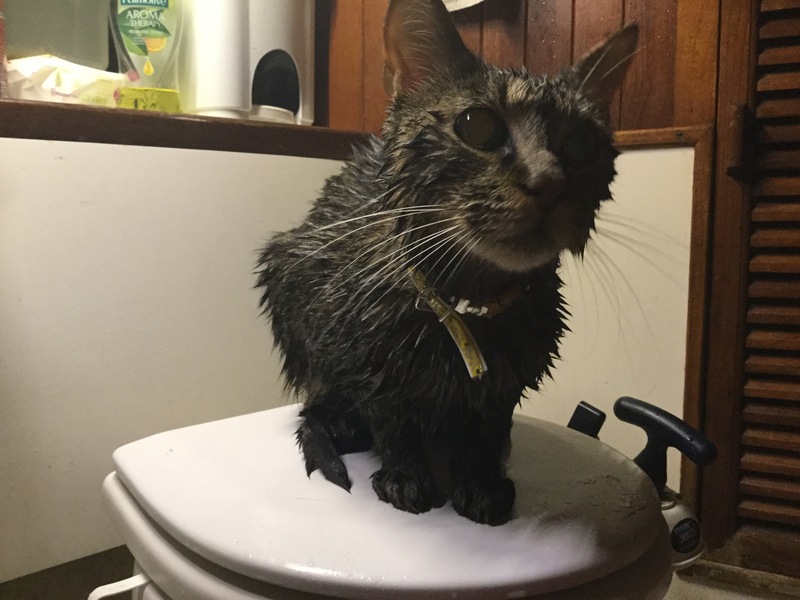 Your humans are really nice, they weren’t sure which boat I came from because my collar doesn’t say, so they said I could stay in your bathroom. It was so kind of you to give me some of your food Bailey and loan me your travel litter box. I was very comfortable. My humans left notes on all of the unfamiliar boats asking if they’d lost you. You’ve made quite a splash here on our pontoon! Well I’m usually quite shy, but it was nice to have so much attention this morning. I felt a little bit silly but very loved. Try and keep your paws dry. Definitely don’t go swimming in the middle of the night! No, not at the moment but I’m so happy to have met you, April and your humans. Thank you again Bailey. I’m going to enjoy lots of treats and love on my boat now! You’re very welcome Gery I’m so happy we could help you and that we got you home safely this morning. It was a purrleasure to have you, I’ve never had a sleepover on Nocturne before, it was fun! « A lovely lazy week! What a nice kitty! Glad that everything went for the best. WOW! Thank God you are ok Gery! That had to be so very scary. So happy your safe and back home. My mom is so afraid of the water that I don’t have to ever worry about living on a boat, but we have other scary things to worry about living in the country. Glad that you met Bailey, because I have a serious crush on him. Wow Bailey, Your family are all heroes! I too am glad that the story had a happy ending! That was awesome! So thankful for a happy ending! Wow! You trained your humans very well, Bailey. They are real heroes!!! Glad to meet Geri! So lucky for Gery that April needed to be walked at that time and on that route. Oh my! Lucky Gery to have been rescued by Bailey’s humans! You poor thing – I know that was scary and I bet you were tired of swimming when they found you. Glad you are alright………….please don’t try and get off your boat again – stay safe and stay aboard! Gerry is a cutie, I am glad your Mom rescued him and was able to find his humans. So glad this exciting story turned out well and Gery made new friends ! My goodness! What an adventure for Gery and all of your family, B. Your humans were definitely in the right place at the right time. Great interview. OMC! Gery was so lucky that your humans were out there to save him! Gery, you are very lucky that Bailey’s humans were there to rescue you! I bet it will be a VERY long time before you try that again! Lucky Gery for having been found. 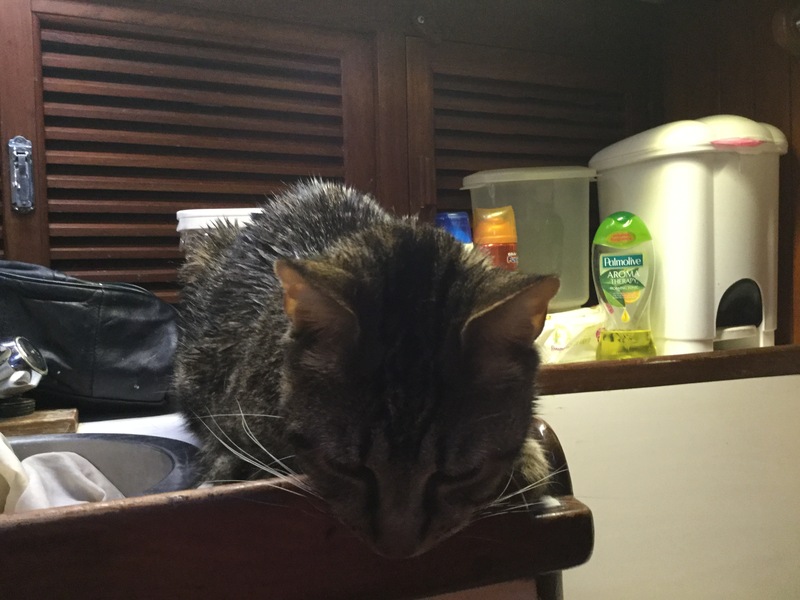 Night dips aren’t a good idea and we hope you suggest Gery’s humans engrave the name of their boat and contact details on his name plate! Gery is one lucky kitty! Good you and your humans were around to help him! Sounds like he needs a life vest like yours, Bailey. Gery was lucky to swim to the right boat! And now you have another furriend!